-One update I missed earlier this week, but this was not a surprise: Harry Young was reassigned to Kalamazoo on Tuesday, after only making one appearance in the lineup since his recall on January 17th. -Yesterday New Jersey placed Cam Janssen on waivers (making for celebrations all over the Jersey portion of my Twitter feed), earlier today he cleared and was subsequently assigned to Albany to make room for the return of Adam Henrique to the lineup this evening. Cam is no stranger to the Capital Region, as he began his pro career as a River Rat back in 2004-05. And he became quite popular over his two season tenure here (the fanbase loves fighters and goalies). If my count is correct, he becomes the fifth Devil River Rat to play in Albany (the other 4: Patrick Davis, Stephen Gionta, PL3, Mark Fraser) since the move from Lowell. And with two established fighters on both Providence and Portland, this weekend’s games may have become just a little more entertaining. The team may be on break, but the news updates aren’t. -Late yesterday morning, Mattias Tedenby was reassigned to Albany after appearing in all 4 games and only registering one assist. He had been shifted to fourth line duty Sunday night in Montreal (the one night I finally got to see a NJ game and took note of that). He had been on a 4 game goal streak when he was recalled for the start of training camp on the 13th. -As for his replacement? No one had been recalled at the same time, leading to everyone speculating that it would be Bobby Butler going up, but since he was busy at the AHL All Star Classic in Providence (more on that shortly) the callup couldn’t happen till the next day. Well, New Jersey decided to throw a curveball…instead of Butler, it will be Matt Anderson going up to the big club for the first time. He will be making his NHL debut in Boston tonight, wearing #12 and taking Tedenby’s spot on the fourth line with Jacob Josefson and Krys Barch. It’s a well deserved chance for Anderson, after coming to the Devils as a free agent in 2010. Sunday night the West All Stars mounted a late event comeback to beat its East counterparts 12-11. Butler, who was the lone Albany representative, got into 3 events: Rapid Fire, teaming up with Syracuse defenseman Radko Gudas (and his now epic Tweeting beard) and scoring twice on Abbotsford goalie Barry Brust; Accuracy Shooting, hitting 2 targets in 8 attempts; and the Breakaway Relay, going scoreless against Grand Rapids goaltender Petr Mrazek. I do want to give a little shoutout to former River Rats goaltender Justin Peters, now with Charlotte, for taking home the Top Goaltender award. Full results can be found here. On to the game itself. The West grabbed an early 4-1 lead after 1 period, but had to rally in the third period to grab a 7-6 win. Ryan Hamilton of Toronto was named the MVP notching a hat trick, the third goal the game winner off of Binghamton’s Robin Lehner with just 11 seconds left in regulation. Butler did snag one assist on a Bracken Kearns (Worcester) goal in the second period. Earlier on Monday came the AHL Hall of Fame ceremony and the annual State of the League address. Our friends from Chirps at Center Ice has the full address wrapup here (audio included), but of local note: the league is committed to keeping AHL hockey in Glens Falls (oh joy…sorry, just a little whiny after having to play them 4 times in 5 games), and also in Hartford despite the affiliation and lease all expiring at the end of the season (the Rangers moving the Whale to Glens Falls rumors have been around for awhile…someone even tried to suggest the Devils would go up there. Yeah right.). The week began with a midweek tilt at home against the division leading Falcons. Not much to write home about in this one. Despite the Devils outshooting their guests 13-12 in the first, they were down 1-0 thanks to a Cody Goloubef goal 9 minutes in. Things didn’t get any better in the second period…Michael Chaput (fun fact: he is the younger brother of former River Rat Stefan, now in Hamilton) gave the Falcons a 2-0 cushion 4:39 into the period. Mike Sislo cut the deficit in half with a short handed goal less than a minute later. Then with just over 6 minutes left in the period, an odd double penalty call on rookie defenseman Raman Hrabarenka gave Springfield’s Ryan Russell a penalty shot. Jeff Frazee would deny it thanks to his trusty goalie post. But less than a minute later the defense was caught napping and Scott Howes would capitalize, giving the Falcons the two goal lead right back. Tomas Kubalik would extend the lead to 4-1 on a video reviewed goal (it bounced off the top of the crossbar and dropped just barely over the goal line…we all thought it was cleared out in time but it was not) 90 seconds into the third. Joe Whitney would add his 9th goal of the season 4 minutes later, but that’s as close as the Devils would get. It wasn’t the greatest of nights defensively, as only two Devils (Whitney and Jay Leach) finished with a + rating (Corbin McPherson, normally steady on defense, finished a -3). 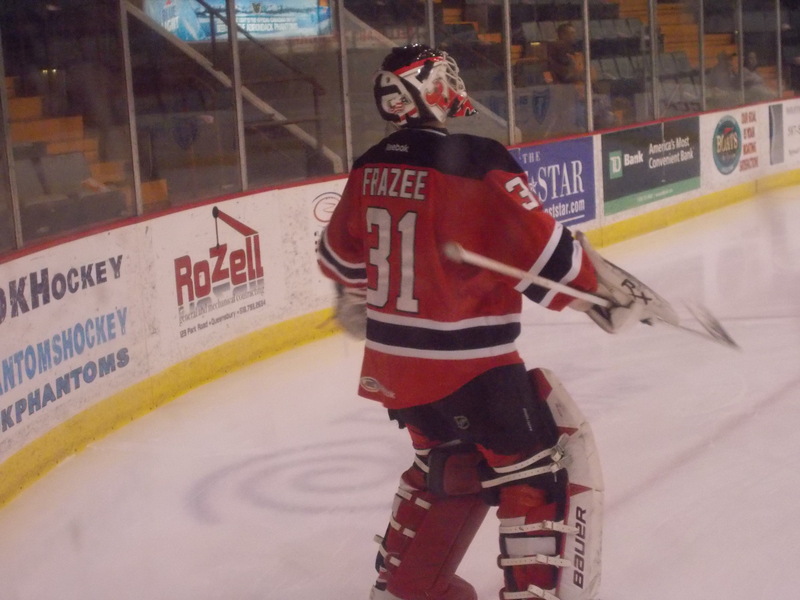 Frazee finished with 29 saves on 33 chances in the loss, and Bobby Butler had the lone assist. 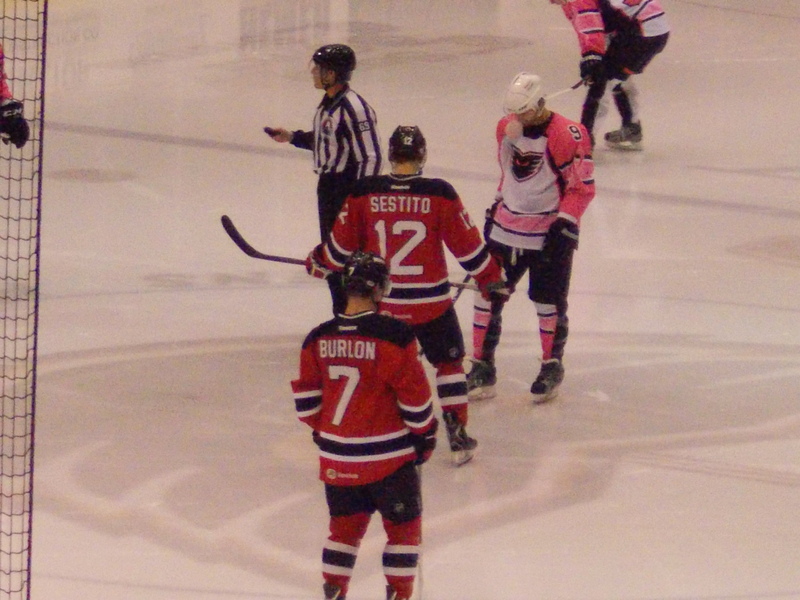 For the second time in 7 days, the Devils headed north on Interstate 87 to take on the Phantoms, who on this night were sporting very pretty pink jerseys as part of a Pink in the Rink promotion (sadly, no pink ice, just the jerseys). Unlike last week, when the Devils outshot Adirondack by a huge margin, it was the Phantoms who came out shooting in the first period, with a 12-3 advantage. But the Devils made their precious few shots count…on their second of the game, Joe Whitney scored for the early 1-0 advantage. Keith Kinkaid managed to stop all 12 chances. The momentum would shift over in the Devils favor in the second, as they added to the lead on a Matt Anderson goal nearly halfway through the period. Matthew Ford would score on a power play to cut the deficit in half, but that’s all Adirondack would manage to get. Albany took over in the third, scoring twice and outshooting the Phantoms 18-6. After Kinkaid stopped the team’s second consective penalty shot (this one off the stick of Harry Zolnierczyk), Whitney would score his second of the game for a two goal lead, then Kelly Zajac scored his second as a pro with 7 minutes left for some extra insurance. 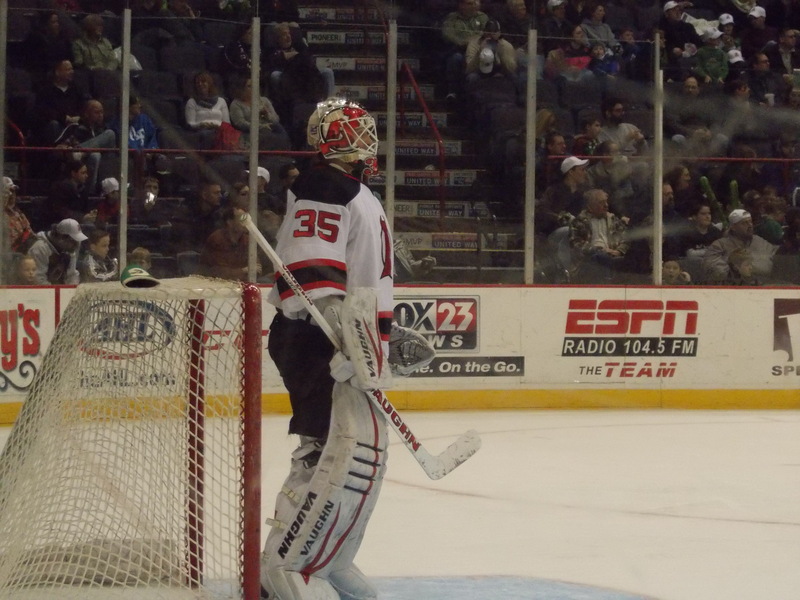 Kinkaid had an excellent showing in net, stopping 26 of 27 and earning second star of the game honors. 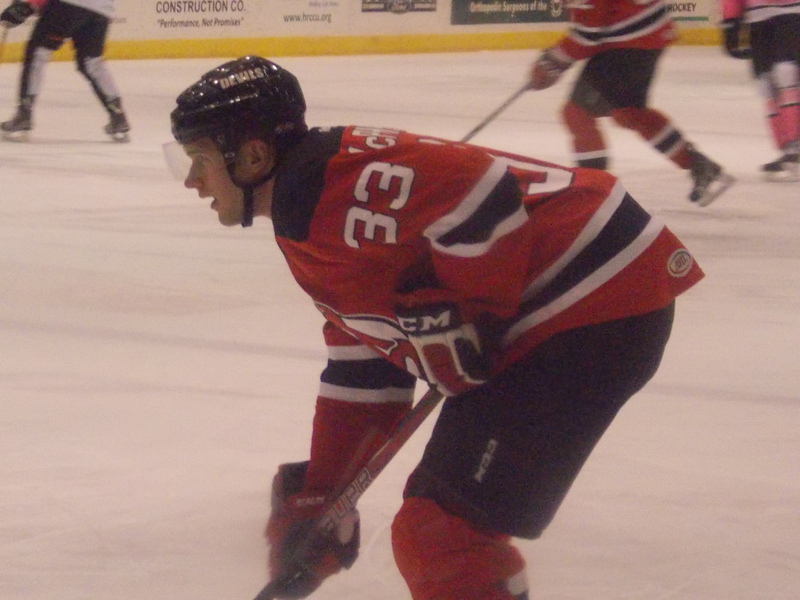 Steve Zalewski contributed two assists. 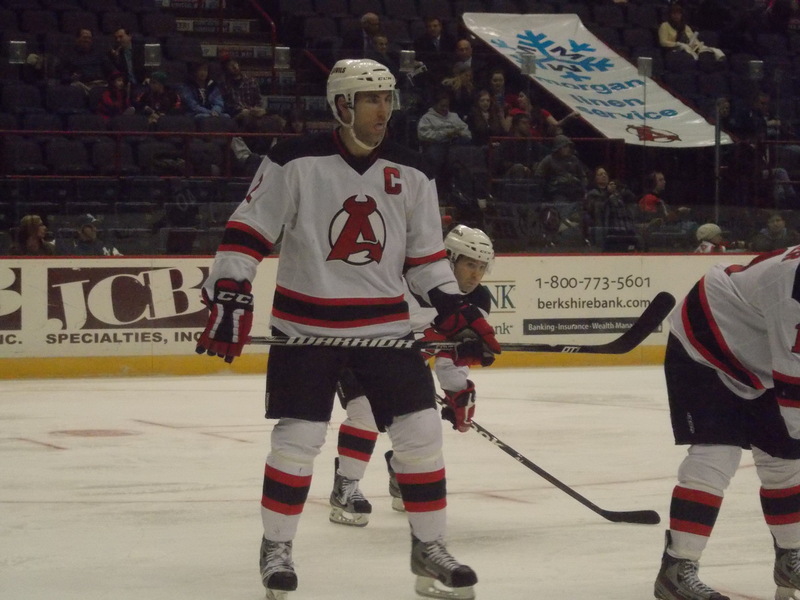 The Devils and Phantoms finished off the home and home with an early Saturday afternoon tilt in downtown Albany. I knew it was going to be a big day when I walked in and saw every single upper deck section had the black curtains lifted up. I haven’t seen that for hockey in quite a long time, probably way back in the River Rats days. But more on that in a bit. 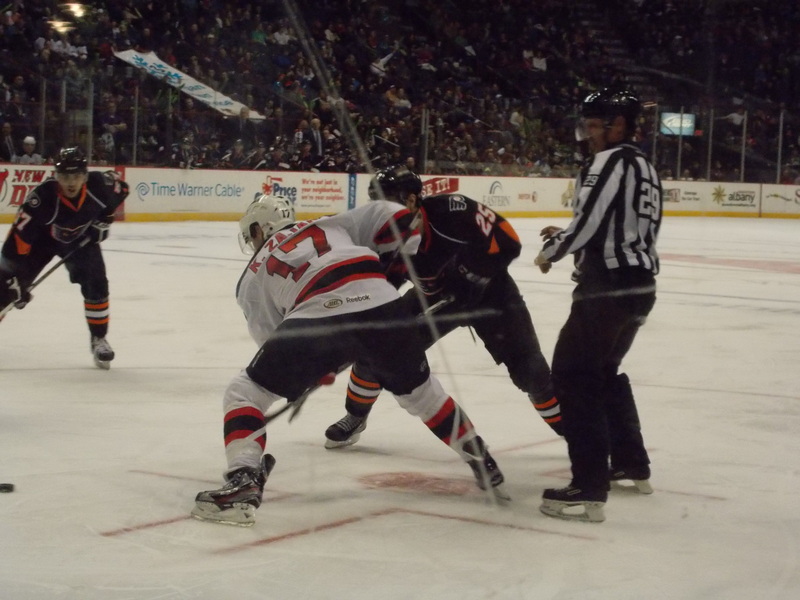 This game was all Devils from the start, as they put up a 3 spot in the first period against Scott Munroe. Steve Zalewski got the scoring going 4 minutes into the period. Harri Pesonen was next in line, scoring 6 minutes later. Then Bobby Butler would add his team leading 16th with 5 and a half remaining. All of this was on just 6 shots on goal…Keith Kinkaid stopped all 9 Phantom shots. Marcel Noebels would get Adirondack on the board in the second with a power play goal (just 22 seconds into the penalty kill…they either give it up early or completely kill it off it seems). 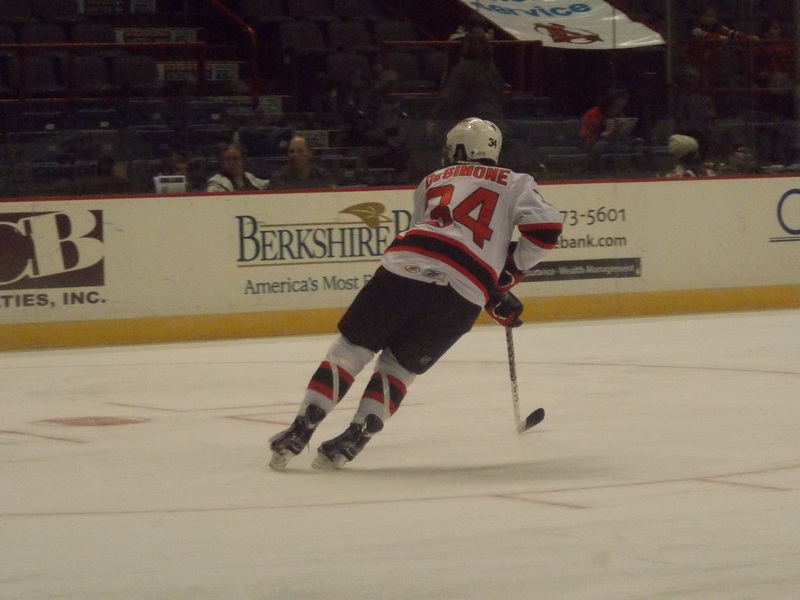 Pesonen would return the favor 4 minutes into the third with his second of the day on a power play for a 4-1 lead. Danny Syvret would cut the lead to 4-2 just before the penalty kill ended. Then Darcy Zajac would seal it with a short handed empty netter with just 13 seconds left to close out the win. Another good day in net for Kinkaid as he stopped 26 of 28 shots. 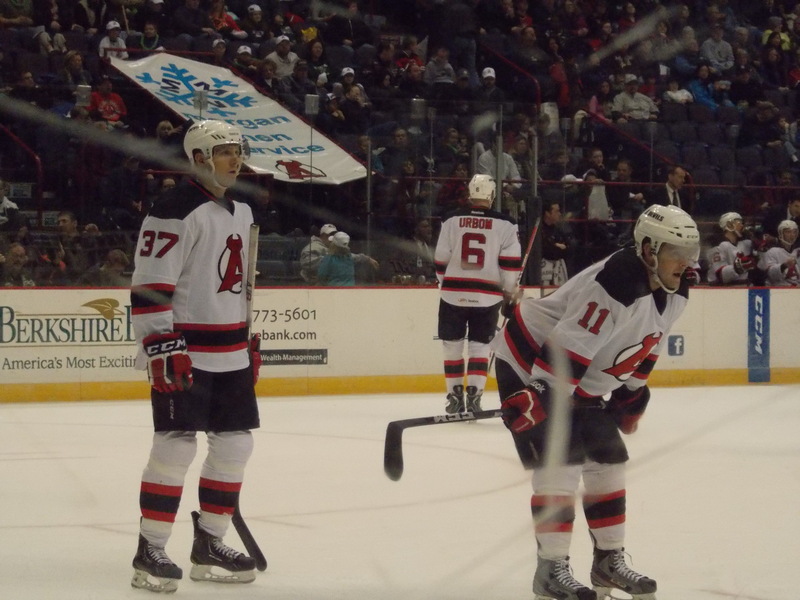 Tim Sestito, Eric Gelinas, and Phil DeSimone would each add two assists. But the biggest story of the day had to be the announced attendance…ready? A whopping 10,218 people witnessed this one, which shatters the old Devils AHL attendance record by over 2000 (this just counts Lowell/Albany). If you really want to dig into attendance records, there hasn’t been a crowd like this since the River Rats heyday in the mid 90s, when 10,000+ crowds almost seemed like the norm, especially when the old Adirondack Red Wings came to town. 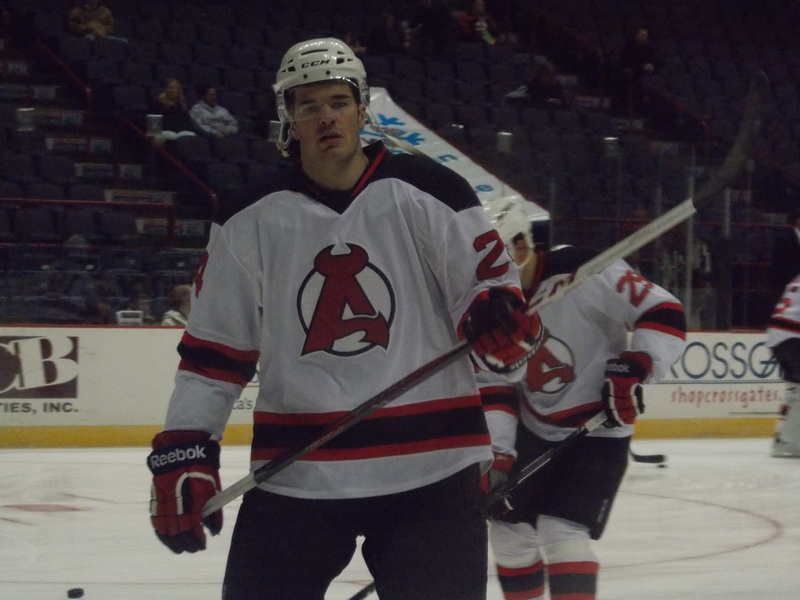 -Forward Bryan Haczyk was reassigned to Trenton on Friday, after only appearing in one game since coming up two weeks ago while a few Albany forwards were participating in New Jersey’s training camp. -Injury update: Only three on the list, all had sat out the week. Chad Wiseman (lower body) and Scott Parse (hip) were both expected to be available, but neither made an appearance. David Wohlberg (lower body) sat out as well, we’ll know more about their return to the lineup once everyone returns to work after the break. -Yesterday morning the AHL All Star starting lineups were announced, all selected by fan voting…and Bobby Butler was chosen as one of the starting forwards, along with Nino Niederreiter of Bridgeport and Jonathan Audy-Marchessault of Springfield. Lineups for both can be seen here. After a nice four day vacation for the rest of the Devils, it’s back to work at the end of the week, as they start the month of February with a 6 game road trip. The first two stops come Friday night in Providence and Saturday night in Portland. Looking ahead at the month, the Devils only touch home ice three times (well, four if you count the final stop in Atlantic City on the 24th), with this New England swing the furthest they will travel. Historically this part of the schedule is always heavy on travel for Albany (this goes back to the River Rat days as well), so this is a great time to judge what these guys have got as they make the push to move up in the standings. I’ll Show You A Girl’s Guide. Getting back on my soapbox again. No Devil fans, I’m leaving you alone this time (you actually have improved since my November rant, bravo!). This time, I’m pointing it at the Rangers. As I was getting ready to leave for Glens Falls yesterday, a very interesting story started popping up on my Twitter feed about an article the team posted on its own feed (which I would have linked for you, but it has mysteriously vanished. Hmmm…I wonder why), the Girl’s Guide to Watching the Rangers. Thanks to those who shot screen caps of the story before it was taken down, I had the chance to look through the story. And all I have to say is…WHAT? Now let’s take the steps apart piece by piece, shall we? Step 1: Knowing when to ask questions. Our brilliant author suggests waiting until a stoppage in play or a penalty call to ask a male fan what’s going on. “You need to sense the tension at certain points in the game and let them do their jumping, screaming, and cheering thing. You can tell if something huge has happened by their reaction…” That’s not how I learned. I actually watched it, and over time the more I watched (at first on TV, then finally when I started going to River Rats games) I picked up on all the nuances of the game. If this were the playoffs, particularly the Stanley (or in my area of expertise, Calder) Cup Finals, you’d be silent the entire game. There is no such thing as a dumb question (unless you work in retail customer service, but that’s another topic), it’s how you learn. Step 2: Get to know the Rangers. By just hearing last names during the broadcast. Just because you heard Sam Rosen say Del Zotto or Staal, you automatically know who they are. Again, just watch! And actually read up on the players in news articles and such (no, the New York Post fashion spread does not count…yes I actually Googled it just for this post) to learn more about them. I actually do that with some of the Devils’ opponents, reading a lot of blogs and news articles to learn about the opponent coming up, just to get an idea of what to expect. If you take the time to do your homework, you’ll be better informed and get a better understanding. Step 3: Get to know goalie Henrik Lundqvist. Trust me this is all you need to know: Watch this video. Yeah, you knew I would throw that in. But in all seriousness, he’s a Vezina winner (but Marty still has more, so much more), he can play guitar (and I hate to admit, he’s actually not bad…damn you HBO 24/7), and it’s fun when the Devils beat him (although I caught myself cheering him on against Philly the other night…what does a Devil fan do when the Rangers and Flyers, the two most hated rivals of New Jersey, play each other?). And by the way, if New York were to have a new face on the quarter, it would most likely be Derek Jeter. At least he knows how to win championships. Step 4: You’ve graduated level one. Do I even want to know what Level Two is? The point is this: Once again, the female hockey fan is getting the short end in favor of those who care more about pleasing their significant other and trying to sound smart than actually showing a real interest in the game. If you’re trying to win over new fans especially after the lockout debacle, go for it. But don’t dumb down and put all females in the same category. Simply, if you really want to learn more about the game of hockey beyond just sounding smart amongst your male friends, just do your homework. Do the research. Read the blogs, pertinent news stories. Actually watch games and listen to interviews with players and coaches. Soak up all the information you can. A Girl’s Guide to Girls, by the wonderful ladies at What’s Up, Ya Sieve? A nice rebuttal from Diana C. Nearhos at the Post Star Phantoms blog. And you know the Devils Army had to chime in with their own guide, this one for the guys. Author icepuddlePosted on January 26, 2013 Tags randomLeave a comment on I’ll Show You A Girl’s Guide. Location: Glens Falls Civic Center, Glens Falls, NY.